Dutch rescue The new chief exeutive of Dutch Railways was confirmed at the start of October as Roger van Boxtel. His appointment has followed the franchise bidding scandal which led to the resignation of Timo Huges in June. 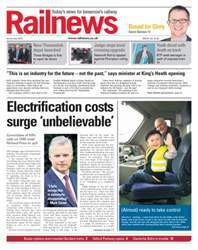 The new CEO wants to restructure NS, which he described as a ‘wounded animal’ following the franchise row, and also boost passenger numbers.